The assault of the Grade 9 student in Rivière-des-Prairies was captured on cellphone video. 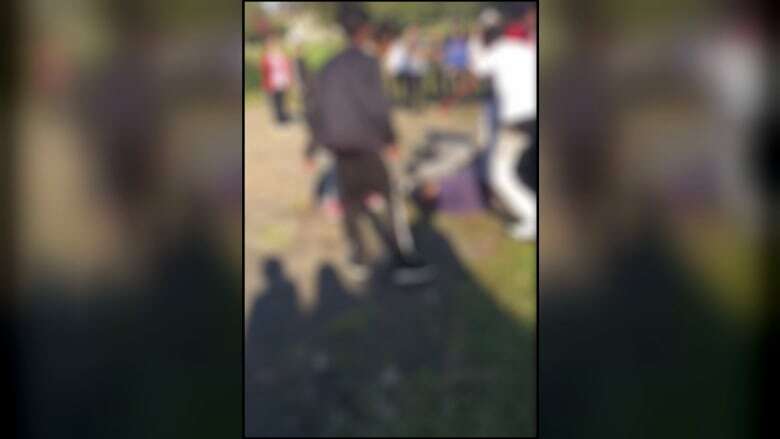 Four teenagers have been charged after an English Montreal School Board student was attacked at a Rivière-des-Prairies park earlier this week. Three suspects are 15 and the other is 16. Police are still looking for one last person who they believe was involved. The group of teenagers was charged Friday with one count each of assault causing bodily harm and conspiracy to commit assault causing bodily harm. They will remain in custody over the weekend and are to appear in court Monday for a bail hearing. The attack was captured on a cellphone video, in which four people can be seen attacking another person. All four attackers were identified as EMSB students and were suspended indefinitely on Wednesday. The victim is a Grade 9 student at the board's Lester B. Pearson High School. In the video, the victim falls to the ground, at which point he is repeatedly kicked by members of the group. As he covers his face, he is punched in the head and jumped on. EMSB spokesperson Michael Cohen confirmed that the victim was not seriously injured. "The student was checked out, he has some bruises but fortunately — and miraculously, for anyone who saw the video — he is OK and he'll be fine," Cohen said. "Shaken up, obviously, by the situation." A copy of the video given to the CBC is less than a minute long. The video contains graphic content.